By Aaron Sankin, December 29, 2016, in Reveal. Pawnshops don’t exactly have the best of reputations. Their business model – offering people short-term loans using personal items as collateral – has consistently drawn complaints suggesting the industry preys upon the needy. In 2012, when a national chain wanted to open a pawnshop in a long-vacant lot in Chicago’s predominantly African American 18th Ward, for example, community members erupted up in strident opposition. If there’s such a negative public perception of pawnshops why do some 30 million Americans use them every year? The reason, insists PawnGuru co-founder Jordan Birnholtz, is pawnshops have become a refuge of last resort for millions of low-income Americans systematically underserved by traditional, mainstream financial institutions. People deciding to use pawnshops, he argues, is an entirely rational choice exposing the fundamental failure of the U.S. banking system to meet the needs of many poor people. Launched in 2014, PawnGuru is an online service intended to give people pawning their personal items increased leverage in the process. Someone can log in to PawnGuru, post the item he or she wants to pawn and receive bids from multiple pawnshops in their area. Prices offered by different shops can vary wildly. For example, offers on a single diamond ring Birnholtz shopped around to different storefronts in the Detroit area ranged from $65 to $1,060. In its two years of existence, PawnGuru has built up a substantial email list from the more than 160,000 people who have used its site. Birnholtz recently became interested in seeing if he could gain better insight into why people used pawnshops in the first place, so he sent out a survey to his email list asking sellers about their financial behavior and experience with the mainstream banking system. 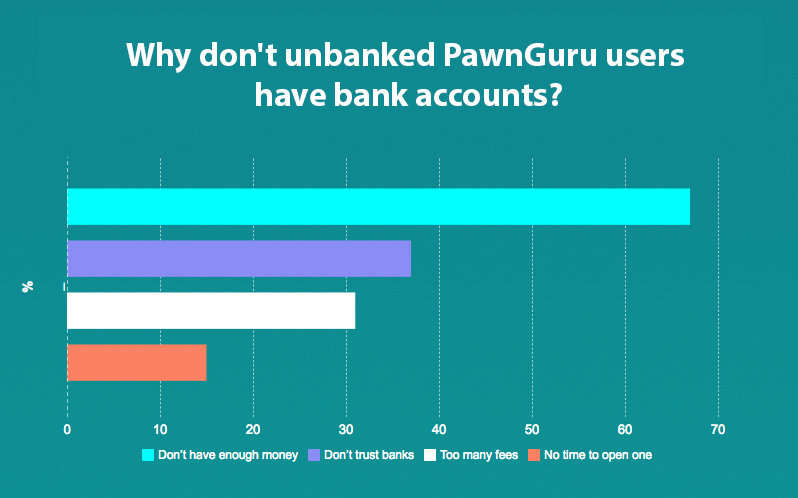 What he discovered in the responses of the 590 people who filled out his survey was a striking divergence between PawnGuru’s users and the American population as a whole. The PawnGuru survey found 32 percent of respondents have no bank account, compared with 15 percent of U.S. consumers who responded to a recent Pew survey indicating that they are “unbanked.” When Birnholtz’s survey dug into people’s justifications for not having bank accounts, just over two-thirds said they didn’t have enough money to maintain a minimum balance, 37 percent said they didn’t trust banks enough to handle their money, 31 percent said bank accounts came with too many fees and 15 percent said they lacked the free time to open an account. The survey found pawnshop customers are also likely to frequent other institutions of alternative finance – nearly half have used a title or payday lending service, 39 percent have used a check-cashing service, 30 percent have used a payday advance store and 10 percent have used an online peer-to-peer lending service like LendUp. A 2015 report from the FDIC found that there are 9 million U.S. households where no individual had a checking or savings account. The report noted that there are 24.5 million households with at least one checking account that lacks access to other ancillary banking services and therefore fill the gap with alternative finance operations like check-cashing services, payday loans, and, yes, pawnshops. For example, someone without a credit card might pawn a personal item to make a purchase they can’t immediately afford. Even though a lack of resources is typically what leads people to use bank alternatives, eschewing banks tends to cost far more in the long run. A family bringing in $25,000 in annual income that is underserved by the traditional banking system spends, on average, $2,400 a year on financial transactions. People are being pushed into the alternative-finance sector in order to make ends meet. Birnholtz shared a number of anonymized conversations that have taken place on the PawnGuru platform between pawnshop employees and prospective sellers that reveal people living on an economic knife edge. Another user turned down an offer to chat with a pawnbroker over the phone because he or she had no more minutes left on a pre-paid phone card. Ted Beck, president and CEO of the National Endowment for Financial Education and member of the FDIC Advisory Committee on Economic Inclusion, argues pawnshops are deeply imperfect substitute for traditional financial institutions. “While often convenient, alternative services to the banking system can be risky and have very high costs associated with them,” Beck noted, adding that his organization is increasingly seeing proactive involvement from financial institutions to provide reasonably priced core banking services to potential low-income customers. One notable effort was the FDIC’s Model Safe Accounts Pilot program. Launched in 2011, the program, which drew participation from nine financial institutions from banking giants to local banks pushed banks to offer electronic, card-based accounts with targeted at underbanked, low-income consumers. The accounts had low overhead of the banks and minimal fees for customers. Over 3,500 accounts were created during the year-long program and the overwhelming majority stayed open and active through the effort’s entirety. Birnholtz, however, still sees pawnshops as an important part of the financial safety net for people who have fallen through the cracks of the traditional banking system. One of the most striking findings from PawnGuru’s survey had to do with overdraft fees, which occur when a bank customer withdraws too much and their account runs a negative balance. Banks can either deny the transaction, leaving the account holder to find some alternative means of payment, or complete the transaction by essentially giving the customer an automatic loan. The fees on these loans can be significant – a $35 charge on a $5 overdraft, with additional charges tacked on to unpaid fines on a daily basis, isn’t uncommon – when people are financially vulnerable. Birnholtz’s survey discovered that 70 percent of regular pawnshop users on his site had incurred either overdraft fees on their bank accounts or a similar fee levied by banks when an account goes under a predetermined minimum balance. The national average for experiencing these fees is 30 percent. In 2010, the federal government implemented rules aimed at stemming the tide of overdraft charges. The policy requires banks to automatically set customer accounts to not allow overdrafting. If customers wanted the ability to overdraft, they would have to voluntarily opt in. A 2014 study by the Pew Charitable Trust backs up Birnholtz’s observations. The study found that over half of the people who reported overdrafting their bank accounts had no recollection of opting into overdraft protection – even though 68 percent of respondents said they would rather have a transaction declined rather than being forced to pay an overdraft fee. There is, however, a third way toward financial inclusion of low-income Americans outside of the traditional vs. alternative finance binary. For much of the early 20th century, Americans could complete basic financial services, such as depositing money in a savings account, at the post office. Some postal officials see the potential to refill the agency’s increasingly empty coffers. “We can better serve the public by offering affordable, non-profit financial services – paycheck cashing, bill payment, savings accounts and small loans – to people who desperately need them,” said American Postal Workers Union President Mark Dimondstein in a statement accompanying an online petition pushing postal banking in the U.S.
For the U.S. Postal Service to take deposits and make loans, the two primary hallmarks of a traditional bank, congressional legislation would be required. Despite the vocal support of liberal politicians such as Sen. Bernie Sanders, I-Vt., and Sen. Elizabeth Warren, D-Mass., the idea has yet to gain significant legislative traction.